In order that we may start afresh and go to Meg's wedding with free minds, it will be well to begin with a little gossip about the Marches. And here let me premise that if any of the elders think there is too much `lovering' in the story, as I fear they may (I'm not afraid the young folks will make that objection), I can only say with Mrs. March, "What can you expect when I have four gay girls in the house, and a dashing young neighbor over the way?" The three years that have passed have brought but few changes to the quiet family. The war is over, and Mr. March safely at home, busy with his books and the small parish which found in him a minister by nature as by grace, a quiet, studious man, rich in the wisdom that is better than learning, the charity which calls all mankind `brother', the piety that blossoms into character, making it august and lovely. These attributes, in spite of poverty and the strict integrity which shut him out from the more worldly successes, attracted to him many admirable persons, as naturally as sweet herbs draw bees, and as naturally he gave them the honey into which fifty years of hard experience had distilled no bitter drop. Earnest young men found the gray-headed scholar as young at heart as they, thoughtful or troubled women instinctively brought their doubts to him, sure of finding the gentlest sympathy, the wisest counsel. Sinners told their sins to the pure-hearted old man and were both rebuked and saved. Gifted men found a companion in him. Ambitious men caught glimpses of nobler ambitions than their own, and even worldlings confessed that his beliefs were beautiful and true, although `they wouldn't pay'. Mrs. March is as brisk and cheery, though rather grayer, than when we saw her last, and just now so absorbed in Meg's affairs that the hospitals and homes still full of wounded `boys' and soldiers' widows, decidedly miss the motherly missionary's visits. John Brooke did his duty manfully for a year, got wounded, was sent home, and not allowed to return. He received no stars or bars, but he deserved them, for he cheerfully risked all he had, and life and love are very precious when both are in full bloom. Perfectly resigned to his discharge, he devoted himself to getting well, preparing for business, and earning a home for Meg. With the good sense and sturdy independence that characterized him, he refused Mr. Laurence's more generous offers, and accepted the place of bookkeeper, feeling better satisfied to begin with an honestly earned salary than by running any risks with borrowed money. Meg had spent the time in working as well as waiting, growing womanly in character, wise in housewifely arts, and prettier than ever, for love is a great beautifier. She had her girlish ambitions and hopes, and felt some disappointment at the humble way in which the new life must begin. Ned Moffat had just married Sallie Gardiner, and Meg couldn't help contrasting their fine house and carriage, many gifts, and splendid outfit with her own, and secretly wishing she could have the same. But somehow envy and discontent soon vanished when she thought of all the patient love and labor John had put into the little home awaiting her, and when they sat together in the twilight, talking over their small plans, the future always grew so beautiful and bright that she forgot Sallie's splendor and felt herself the richest, happiest girl in Christendom. Jo never went back to Aunt March, for the old lady took such a fancy to AMy that she bribed her with the offer of drawing lessons from one of the best teachers going, and for the sake of this advantage, Amy would have served a far harder mistress. So she gave her mornings to duty, her afternoons to pleasure, and prospered finely. Jo meantime devoted herself to literature and Beth, who remained delicate long after the fever was a thing of the past. Not an invalid exactly, but never again the rosy, healthy creature she had been, yet always hopeful, happy, and serene, and busy with the quiet duties she loved, everyone's friend, and an angel in the house, long before those who loved her most had learned to know it. `rubbish', as she called it, Jo felt herself a woman of means, and spun her little romances diligently. But great plans fermented in her busy brain and ambitious mind, and the old tin kitchen in the garret held a slowly increasing pile of blotted manuscript, which was one day to place the name of March upon the roll of fame. Being only `a glorious human boy', of course he frolicked and flirted, grew dandified, aquatic, sentimental, or gymnastic, as college fashions ordained, hazed and was hazed, talked slang, and more than once came perilously near suspension and expulsion. But as high spirits and the love of fun were the causes of these pranks, he always managed to save himself by frank confession, honorable atonement, or the irresistible power of persuasion which he possessed in perfection. In fact, he rather prided himself on his narrow escapes, and liked to thrill the girls with graphic accounts of his triumphs over wrathful tutors, dignified professors, and vanquished enemies. The `men of my class', were heroes in the eyes of the girls, who never wearied of the exploits of `our fellows', and were frequently allowed to bask in the smiles of these great creatures, when Laurie brought them home with him. Amy especially enjoyed this high honor, and became quite a belle among them, for her ladyship early felt and learned to use the gift of fascination with which she was endowed. Meg was too much absorbed in her private and particular John to care for any other lords of creation, and Beth too shy to do more than peep at them and wonder how Amy dared to order them about so, but Jo felt quite in her own element, and found it very difficult to refrain from imitating the gentlemanly attitudes, phrases, and feats, which seemed more natural to her than the decorums prescribed for young ladies. They all liked Jo immensely, but never fell in love with her, though very few escaped without paying the tribute of a sentimental sigh or two at Amy's shrine. And speaking of sentiment brings us very naturally to the `Dovecote'. That was the name of the little brown house Mr. Brooke had prepared for Meg's first home. Laurie had christened it, saying it was highly appropriate to the gentle lovers who `went on together like a pair of turtledoves, with first a bill and then a coo'. It was a tiny house, with a little garden behind and a lawn about as big as a pocket handkerchief in the front. Here Meg meant to have a fountain, shrubbery, and a profusion of lovely flowers, though just at present the fountain was represented by a weather-beaten urn, very like a dilapidated slopbowl, the shrubbery consisted of several young larches, undecided whether to live or die, and the profusion of flowers was merely hinted by regiments of sticks to show where seeds were planted. But inside, it was altogether charming, and the happy bride saw no fault from garret to cellar. To be sure, the hall was so narrow it was fortunate that they had no piano, for one never could have been got in whole, the dining room was so small that six people were a tight fit, and the kitchen stairs seemed built for the express purpose of precipitating both servants and china pell-mell into the coalbin. But once get used to these slight blemishes and nothing could be more complete, for good sense and good taste had presided over the furnishing, and the result was highly satisfactory. 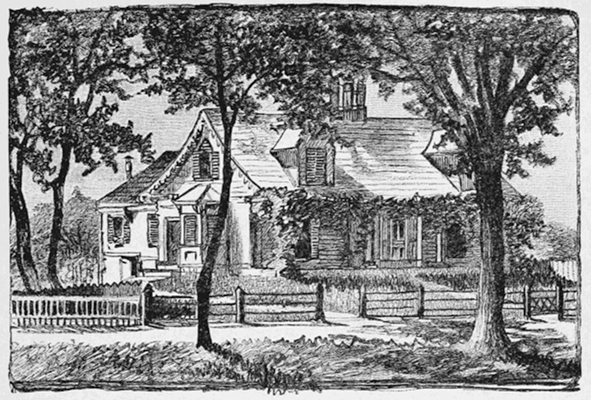 There were no marble-topped tables, long mirrors, or lace curtains in the little parlor, but simple furniture, plenty of books, a fine picture or two, a stand of flowers in the bay window, and, scattered all about, the pretty gifts which came from friendly hands and were the fairer for the loving messages they brought. I don't think the Parian Psyche Laurie gave lost any of its beauty because John put up the bracket it stood upon, that any upholsterer could have draped the plain muslin curtains more gracefully than Amy's artistic hand, or that any store-room was ever better provided with good wishes, merry words, and happy hopes than that in which Jo and her mother put away Meg's few boxes, barrels, and bundles, and I am morally certain that the spandy new kitchen never could have looked so cozy and neat if Hannah had not arranged every pot and pan a dozen times over, and laid the fire all ready for lighting the minute `Mis. Brooke came home'. I also doubt if any young matron ever began life with so rich a supply of dusters, holders, and piece bags, for Beth made enough to last till the silver wedding came round, and invented three different kinds of dishcloths for the express service of the bridal china. What happy times they had planning together, what solemn shopping excursions, what funny mistakes they made, and what shouts of laughter arose over Laurie's ridiculous bargains. In his love of jokes, this young gentleman, though nearly through college, was a much of a boy as ever. His last whim had been to bring with him on his weekly visits some new, useful, and ingenious article for the young housekeeper. Now a bag of remarkable clothespins, next, a wonderful nutmeg grater which fell to pieces at the first trial, a knife cleaner that spoiled all the knives, or a sweeper that picked the nap neatly off the carpet and left the dirt, labor-saving soap that took the skin off one's hands, infallible cements which stuck firmly to nothing but the fingers of the deluded buyer, and every kind of tinware, from a toy savings bank for odd pennies, to a wonderful boiler which would wash articles in its own steam with every prospect of exploding in the process. In vain Meg begged him to stop. John laughed at him, and Jo called him `Mr. Toodles'. He was possessed with a mania for patronizing Yankee ingenuity, and seeing his friends fitly furnished forth. So each week beheld some fresh absurdity. Everything was done at last, even to Amy's arranging different colored soaps to match the different colored rooms, and Beth's setting the table for the first meal. "Are you satisfied? Does it seem like home, and do you feel as if you should be happy here?" asked Mrs. March, as she and her daughter went through the new kingdom arm in arm, for just then they seemed to cling together more tenderly than ever. "Yes, Mother, perfectly satisfied, thanks to you all, and so happy that I can't talk about it," with a look that was far better than words. "If she only had a servant or two it would be all right," said Amy, coming out of the parlor, where she had been trying to decide whether the bronze Mercury looked best on the whatnot or the mantlepiece. "Mother and I have talked that over, and I have made up my mind to try her way first. There will be so little to do that with Lotty to run my errands and help me here and there, I shall only have enough work to keep me from getting lazy or homesick," answered Meg tranquilly. "Sallie Moffat has four," began Amy. "If Meg had four, the house wouldn't hold them, and master and missis would have to camp in the garden," broke in Jo, who, enveloped in a big blue pinafore, was giving the last polish to the door handles. "Sallie isn't a poor man's wife, and many maids are in keeping with her fine establishment. Meg and John begin humbly, but I have a feeling that there will be quite as much happiness in the little house as in the big one. It's a great mistake for young girls like Meg to leave themselves nothing to do but dress, give orders, and gossip. When I was first married, I used to long for my new clothes to wear out or get torn, so that i might have the pleasure of mending them, for I got heartily sick of doing fancywork and tending my pocket handkerchief." "Why didn't you go into the kitchen and make messes, as Sallie says she does to amuse herself, though they never turn out well and the servants laugh at her," said Meg. "I did after a while, not to `mess' but to learn of Hannah how things should be done, that my servants need not laugh at me. It was play then, but there came a time when I was truly grateful that I not only possessed the will but the power to cook wholesome food for my little girls, and help myself when I could no longer afford to hire help. You begin at the other end, Meg, dear, but the lessons you learn now will be of use to you by-and-by when John is a richer man, for the mistress of a house, however splendid, should know how work ought to be done, if she wishes to be well and honestly served." "Yes, Mother, I'm sure of that," said Meg, listening respectfully to the little lecture, for the best of women will hold forth upon the all absorbing subject of house keeping. "Do you know I like this room most of all in my baby house," added Meg, a minute after, as they went upstairs and she looked into her well-stored linen closet. Beth was there, laying the snowy piles smoothly on the shelves and exulting over the goodly array. All three laughed as Meg spoke, for that linen closet was a joke. You see, having said that if Meg married `that Brooke' she shouldn't have a cent of her money, Aunt March was rather in a quandary when time had appeased her wrath and made her repent her vow. She never broke her word, and was much exercised in her mind how to get round it, and at last devised a plan whereby she could satisfy herself. Mrs. Carrol, Florence's mamma, was ordered to buy, have made, and marked a generous supply of house and table linen, and send it as her present, all of which was faithfully done, but the secret leaked out, and was greatly enjoyed by the family, for Aunt March tried to look utterly unconscious, and insisted that she could give nothing but the old-fashioned pearls long promised to the first bride. "That's a housewifely taste which I am glad to see. I had a young friend who set up housekeeping with six sheets, but she had finger bowls for company and that satisfied her," said Mrs. March, patting the damask tablecloths, with a truly feminine appreciation of their fineness. "I haven't a single finger bowl, but this is a setout that will last me all my days, Hannah says." And Meg looked quite contented, as well she might. A tall, broad-shouldered young fellow, with a cropped head, a felt basin of a hat, and a flyaway coat, came tramping down the road at a great pace, walked over the low fence without stopping to open the gate, straight up to Mrs. March, with both hands out and a hearty . ..
"Here I am, Mother! Yes, it's all right." "For Mrs. John Brooke, with the maker's congratulations and compliments. Bless you, Beth! What a refreshing spectacle you are, Jo. Amy, you are getting altogether too handsome for a single lady." As Laurie spoke, he delivered a brown paper parcel to Meg, pilled Beth's hair ribbon, stared at Jo's bib pinafore, and fell into an attitude of mock rapture before Amy, then shook hands all round, and everyone began to talk. "Where is John?" asked Meg anxiously. "Stopped to get the license for tomorrow, ma'am." "Which side won the last match, Teddy?" inquired Jo, who persisted in feeling an interest in manly sports despite her nineteen years. "Ours, of course. Wish you'd been there to see." "How is the lovely Miss Randal?" asked Amy with a significant smile. "More cruel than ever. Don't you see how I'm pining away?" And Laurie gave his broad chest a sounding slap and heaved a melodramatic sigh. "What's the last joke? Undo the bundle and see, Meg," said Beth, eying the knobby parcel with curiosity. "It's a useful thing to have in the house in case of fire or thieves," observed Laurie, as a watchman's rattle appeared, amid the laughter of the girls. "Any time when John is away and you get frightened, Mrs. Meg, just swing that out of the front window, and it will rouse the neighborhood in a jiffy. Nice thing, isn't it?" And Laurie gave them a sample of its powers that made them cover up their ears. "There's gratitude for you! And speaking of gratitude reminds me to mention that you may thank Hannah for saving your wedding cake from destruction. I saw it going into your house as I came by, and if she hadn't defended it manfully I'd have had a pick at it, for it looked like a remarkably plummy one." "I wonder if you will ever grow up, Laurie," said Meg in a matronly tone. "I'm doing my best, ma'am, but can't get much higher, I'm afraid, as six feet is about all men can do in these degenerate days," responded the young gentleman, whose head was about level with the little chandelier. "I suppose it would be profanation to eat anything in this spick-and-span bower, so as I'm tremendously hungry, I propose an adjournment," he added presently. "Mother and I are going to wait for John. There are some last things to settle," said Meg, bustling away. "Beth and I are going over to Kitty Bryant's to get more flowers for tomorrow," added Amy, tying a picturesque hat over her picturesque curls, and enjoying the effect as much as anybody. "Come, Jo, don't desert a fellow. I'm in such a state of exhaustion I can't get home without help. Don't take off your apron, whatever you do, it's peculiarly becoming," said Laurie, as Jo bestowed his especial aversion in her capacious pocket and offered her arm to support his feeble steps. "Now, Teddy, I want to talk seriously to you about tomorrow," began Jo, as they strolled away together. "You must promise to behave well, and not cut up any pranks, and spoil our plans." "And don't say funny things when we ought to be sober." "I never do. You are the one for that." "And I implore you not to look at me during the ceremony. I shall certainly laugh if you do." "You won't see me, you'll be crying so hard that the thick fog round you will obscure the prospect." "I never cry unless for some great affliction." "Such as fellows going to college, hey?" cut in Laurie, with suggestive laugh. "Don't be a peacock. I only moaned a trifle to keep the girls company." "Exactly. I say, Jo, how is Grandpa this week? Pretty amiable?" "Very. Why, have you got into a scrape and want to know how he'll take it?" asked Jo rather sharply. `All right', if it wasn't?" And Laurie stopped short, with an injured air. "Then don't go and be suspicious. I only want some money," said Laurie, walking on again, appeased by her hearty tone. "You spend a great deal, Teddy." "Bless you, I don't spend it, it spends itself somehow, and is gone before I know it." "You are so generous and kind-hearted that you let people borrow, and can't say `No' to anyone. We heard about Henshaw and all you did for him. If you always spent money in that way, no one would blame you," said Jo warmly. "Oh, he made a mountain out of a molehill. You wouldn't have me let that fine fellow work himself to death just for want of a little help, when he is worth a dozen of us lazy chaps, would you?" "Of course not, but I don't see the use of your having seventeen waistcoats, endless neckties, and a new hat every time you come home. I thought you'd got over the dandy period, but every now and then it breaks out in a new spot. Just now it's the fashion to be hideous, to make your head look like a scrubbing brush, wear a strait jacket, orange gloves, and clumping square-toed boots. If it was cheap ugliness, I'd say nothing, but it costs as much as the other, and I don't get any satisfaction out of it." "Don't lecture any more, there's a good soul! I have enough all through the week, and like to enjoy myself when I come home. I'll get myself up regardless of expense tomorrow and be a satisfaction to my friends." "I'll leave you in peace if you'll only let your hair grow. I'm not aristocratic, but I do object to being seen with a person who looks like a young prize fighter," observed Jo severely. "This unassuming style promotes study, that's why we adopt it," returned Laurie, who certainly could not be accused of vanity, having voluntarily sacrificed a handsome curly crop to the demand for quarterinch-long stubble. "By the way, Jo, I think that little Parker is really getting desperate about Amy. He talks of her constantly, writes poetry, and moons about in a most suspicious manner. He'd better nip his little passion in the bud, hadn't he?" added Laurie, in a confidential, elder brotherly tone, after a minute's silence. "Of course he had. We don't want any more marrying in this family for years to come. Mercy on us, what are the children thinking of?" And Jo looked as much scandalized as if Amy and little Parker were not yet in their teens. "It's a fast age, and I don't know what we are coming to, ma'am. You are a mere infant, but you'll go next, Jo, and we'll be left lamenting," said Laurie, shaking his head over the degeneracy of the times. "Don't be alarmed. I'm not one of the agreeable sort. Nobody will want me, and it's a mercy, for there should always be one old maid in a family." "You won't give anyone a chance," said Laurie, with a sidelong glance and a little more color than before in his sunburned face. "You won't show the soft side of your character, and if a fellow gets a peep at it by accident and can't help showing that he likes it, you treat him as Mrs. Gummidge did her sweetheart, throw cold water over him, and get so thorny no one dares touch or look at you." "I don't like that sort of thing. I'm too busy to be worried with nonsense, and I think it's dreadful to break up families so. Now don't say any more about it. Meg's wedding has turned all our heads, and we talk of nothing but lovers and such absurdities. I don't wish to get cross, so let's change the subject." And Jo looked quite ready to fling cold water on the slightest provocation. Whatever his feelings might have been, Laurie found a vent for them in a long low whistle and the fearful prediction as they parted at the gate, "Mark my words, Jo, you'll go next."